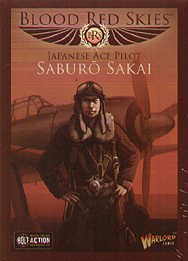 Saburo Sakai was the Imperial Japanese Navy's fourth highest ranking Ace. When was began he shot down the first B-17 to be lost in the Pacific theatre. During a mission over Guadalcanal Sakai was badly injured but still limped his damage plane home and reported to his superior before collapsing. Despite the loss of an eye, Sakai went on to score at least 69 kills.